This shouldn’t be cold. I wouldn’t use one but a brand new 14” laptop with 4GB RAM running Windows 10 for £150 is a bargain and 64GB is enough space for updates. I’m sure it’s just the not got a discrete GPU/8th gen CPU/1TB SSD/full HD display/metal chassis brigade turning up but not explaining. It was posted recently though, maybe that’s why. This shouldn’t be cold. I wouldn’t use one but a brand new 14” laptop with …This shouldn’t be cold. I wouldn’t use one but a brand new 14” laptop with 4GB RAM running Windows 10 for £150 is a bargain and 64GB is enough space for updates. I’m sure it’s just the not got a discrete GPU/8th gen CPU/1TB SSD/full HD display/metal chassis brigade turning up but not explaining.It was posted recently though, maybe that’s why. It was £139.97 a few days ago (I even seem to remember it being £129 at some point). So do you get a memory card rather than a built in hard drive or am I reading it wrong? So do you get a memory card rather than a built in hard drive or am I …So do you get a memory card rather than a built in hard drive or am I reading it wrong? Hey, I brought one for £139.95, it is well built, the screen can go 180°. 1.1ghz? 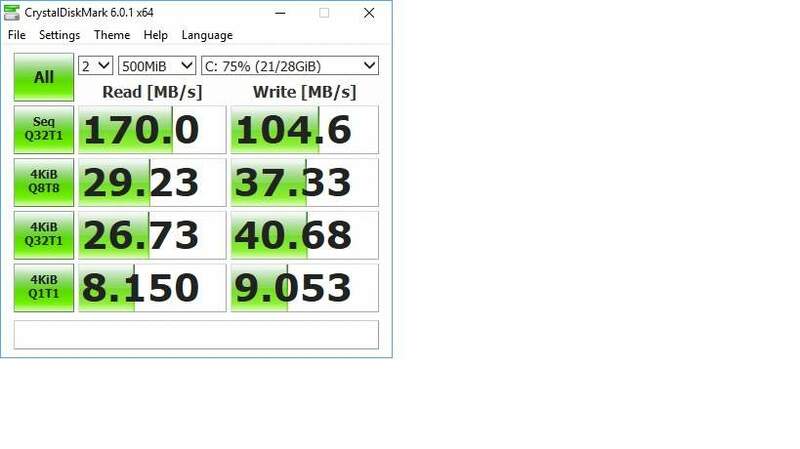 Even with SSD surely that's gonna chug even for everyday tasks? And will there be enough room to load MS Office and run it well? V good price for what it is. emmc speeds if anyones interested. I'd assume cold due to the overall performance I bought one of similar specs around Christmas time and it was awful even with linux on cpu would hit 100% even on desktop, went to local PC World and their budget laptops had the same issues and ended up with a £500 one I got online that does browsing/streaming ok but even 10-12 year old games struggle I know its not a gaming laptop but they should perform better given the increases in tech. I've got an older n27xx laptop and for basic tasks. It's not slow at all browsing, office, music, etc. I've got a SSD on mine. You're assuming that the people that buy laptops like this know exactly what they are buying and it's all they need. If that was the case, then yes this would be a bargain. In reality, I know several people that have bought similar laptops to this for around this price thinking that they will be cheap, cheerful but fast enough for basic applications. And immediately they are shocked that opening 5 tabs in Chrome brings the thing to a grinding halt. Voted cold because for most people it's not a bargain to buy a laptop for £150, then have to immediately sell it because it's so slow and buy something for £300 ish. You're assuming that the people that buy laptops like this know exactly …You're assuming that the people that buy laptops like this know exactly what they are buying and it's all they need. If that was the case, then yes this would be a bargain.In reality, I know several people that have bought similar laptops to this for around this price thinking that they will be cheap, cheerful but fast enough for basic applications. And immediately they are shocked that opening 5 tabs in Chrome brings the thing to a grinding halt.Voted cold because for most people it's not a bargain to buy a laptop for £150, then have to immediately sell it because it's so slow and buy something for £300 ish. I'm not assuming anything, I own the older version of this and can have many tabs open and it's nothing like that - the 100s has 32GB of storage and 2GB of RAM. It's not the fastest thing granted, but it's plenty quick enough for basic applications, that was exactly how I used it til I got a cheap ultrabook elsewhere. If people buy something without doing research or trying someone else's machine first then I have little sympathy and if you know about laptops maybe you should have advised them beforehand. If these things are so terrible, they would not exist because demand would be low and they wouldn't make them - they have their place. Anyway, there is that saying, and if £150 is your budget limit, just buy an ex-lease laptop you'll get far more performance for the same money (tons of machines like Dell E7440 and Lenovo T440). I'm not assuming anything, I own the older version of this and can have …I'm not assuming anything, I own the older version of this and can have many tabs open and it's nothing like that - the 100s has 32GB of storage and 2GB of RAM. It's not the fastest thing granted, but it's plenty quick enough for basic applications, that was exactly how I used it til I got a cheap ultrabook elsewhere.If people buy something without doing research or trying someone else's machine first then I have little sympathy and if you know about laptops maybe you should have advised them beforehand. If these things are so terrible, they would not exist because demand would be low and they wouldn't make them - they have their place.Anyway, there is that saying, and if £150 is your budget limit, just buy an ex-lease laptop you'll get far more performance for the same money (tons of machines like Dell E7440 and Lenovo T440). We are all assuming whenever we vote hot or cold. There are people out there (similar to those I mentioned) that would buy this laptop because of the price even though it's not right for them. There are also people (like yourself) that it serves a purpose for. When I vote cold, I am assuming that there will be more of the former than the latter. We're not really disagreeing, it's just a different assessment of how many people this would be a good deal for. I agree with your suggestion of getting an ex-lease or even used eBay laptop, but again this requires a bit of knowledge. I've met so many people that have just walked into PC World and bought the cheapest laptop there and then spent the next 3 years of their life moaning about how awful their laptop is! I got one of these, and it was fine for browsing. Not sure how good these eMMC cards are in the long run, but it's the same kind of tech I assume in iPads etc? I did think it may be a thought to run Firefox entirely in RAM to reduce disk 'scratching'. You can switch from Windows 0S to 10Pro with ease for no extra cost if that's putting people off. We are all assuming whenever we vote hot or cold. There are people out …We are all assuming whenever we vote hot or cold. There are people out there (similar to those I mentioned) that would buy this laptop because of the price even though it's not right for them. There are also people (like yourself) that it serves a purpose for.When I vote cold, I am assuming that there will be more of the former than the latter.We're not really disagreeing, it's just a different assessment of how many people this would be a good deal for.I agree with your suggestion of getting an ex-lease or even used eBay laptop, but again this requires a bit of knowledge. I've met so many people that have just walked into PC World and bought the cheapest laptop there and then spent the next 3 years of their life moaning about how awful their laptop is! Fair enough - good explanation. But then that's why people know people like us I assume! I wish they would just ask for some basic advice - then they wouldn't come and expect free advice/assistance to speed the thing up later on! I bought a 6th gen Core i5 (Skylake) HP Elitebook 820 G3 for £170 the other day, I fitted an SSD, upgraded the RAM and the whole thing cost me under £200 - it has 2 years HP warranty left on it and would easily out-do this laptop, but none of that is for the faint-hearted. Fair enough - good explanation. But then that's why people know people …Fair enough - good explanation. But then that's why people know people like us I assume! I wish they would just ask for some basic advice - then they wouldn't come and expect free advice/assistance to speed the thing up later on! I bought a 6th gen Core i5 (Skylake) HP Elitebook 820 G3 for £170 the other day, I fitted an SSD, upgraded the RAM and the whole thing cost me under £200 - it has 2 years HP warranty left on it and would easily out-do this laptop, but none of that is for the faint-hearted. That's a very good price for a second hand laptop. I'm still running a Thinkpad that's over a decade old, and I've spruced it up with an SSD and memory. It struggles with some video decoding. Hardware decoding is built into a lot of the cheap cpus/chipsets these days. Where it helps with battery life. The low power CPU in the Ideapad affords no fan, and longer battery run, at the expense of some CPU grunt. It felt okay for basic browsing. 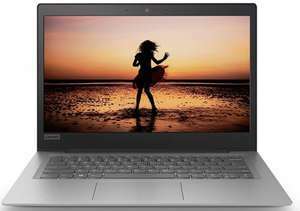 Currys have a Full HD Ideapad, similar form factor, better CPU and an SSD for £350. I've seen these previously sold for £330. However that's a whole £200 pound extra. I nearly bought the above when it was reduced before, but didn't like the feel of the keyboard and the screen still felt a bit small for my personal tastes. My partner has a 1k HP for work, and the build quality isn't actually that different between the cheap Lenovo and the HP. Not the biggest fan of either, but at least the Lenovo is cheap. That's a very good price for a second hand laptop. I'm still running a …That's a very good price for a second hand laptop. I'm still running a Thinkpad that's over a decade old, and I've spruced it up with an SSD and memory. It struggles with some video decoding. Hardware decoding is built into a lot of the cheap cpus/chipsets these days. Where it helps with battery life. The low power CPU in the Ideapad affords no fan, and longer battery run, at the expense of some CPU grunt. It felt okay for basic browsing.Currys have a Full HD Ideapad, similar form factor, better CPU and an SSD for £350. I've seen these previously sold for £330. However that's a whole £200 pound extra.https://www.currys.co.uk/gbuk/computing/laptops/laptops/lenovo-ideapad-320s-14ikb-14-laptop-white-10169169-pdt.htmlI nearly bought the above when it was reduced before, but didn't like the feel of the keyboard and the screen still felt a bit small for my personal tastes. My partner has a 1k HP for work, and the build quality isn't actually that different between the cheap Lenovo and the HP. Not the biggest fan of either, but at least the Lenovo is cheap. The keyboard on the HP Elitebook range is one of the best I've ever had, it's better than current ThinkPads, it also has proper touchpad buttons not a clickpad (which I never liked). If you're thinking about an upgrade, just look on eBay or similar sellers for a bargain ex-lease machine. There are plenty to be had and much better than buying new in terms of value. If all you have is £150 and need a laptop will at least a years warranty because you can't afford it breaking then this is perfect, personally I'd go second hand although this is awesome for a new price. Does anyone know if this any good for watching the likes of BBC iPlayer and Sky Go? Does anyone know if this any good for watching the likes of BBC iPlayer …Does anyone know if this any good for watching the likes of BBC iPlayer and Sky Go? I tried it with iplayer in Firefox browser. Edge ate less CPU. Seemed fine. But the sound is dreadful on this machine. I tried it with iplayer in Firefox browser. Edge ate less CPU. Seemed …I tried it with iplayer in Firefox browser. Edge ate less CPU. Seemed fine. But the sound is dreadful on this machine. Thanks, I tried BBC/ITV/Channel4/5 etc catch up on another low spec laptop and they all worked well. The new Sky Go app however was awful as it uses a ridiculous amount of resources. I suspect I would have the same problem with this laptop but for £140 it will do just about everything else I require it to do. Tempted.